When I first saw the new Urban Decay lash curler I was so excited! I ran to 2 Sephora stores and had no luck. Last Friday the local store finally got it in so I bought it. The next day I woke up psyched to test it out! I went through my makeup routine, waiting for the unveiling of my new tool from the box and went to get busy on lush lashes. Um, it did not work out that way. First of all the finger slots are tiny - I do not have man hands or anything - the slots just felt oddly tiny. Second my lashes did not curl...The biggest deal breaker was when I looked at the curler I noticed a clump of my lashes on the pad! So I am taking this back! I have my couple of years old Shu Uemura that may pinch on occasion but has never taken out lashes! Yikes! Yeah, taking your lashes out is definitely no good. It's too bad they didn't work out. Oh gosh. You are PULLED together!!!! 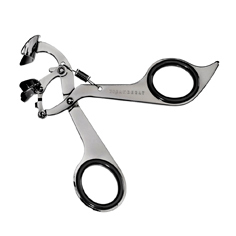 Lash Curler? ?